Donegal 3-7 Mayo 0-12 (Ballybofey, 6/2/1994). MAYO: P Reape; A McGarry, K Cahill, G Ruane; PJ Monaghan, P Holmes, K Mortimer; P Fallon (0-1), C McManamon; K O’Neill (0-8, three frees), R Dempsey (0-2), K Staunton; D Byrne (0-1), J McCallion, K Lydon. Sub: R Golding for Staunton. Mayo 1-5 Kerry 1-9 (Ballina, 20/2/1994). MAYO: P Reape; A McGarry, K Cahill, G Ruane; PJ Monaghan, P Holmes, K Mortimer; P Fallon, C McManamon; K O’Neill (0-1, a free), R Dempsey, K Staunton (0-1); J Conmy, J McCallion, K Lydon (0-3, one a free). Subs: R Golding for Fallon, C McDonald for O’Neill, J Finn for Monaghan. Clare 2-8 Mayo 0-7 (Ennis, 13/3/1994). MAYO: B Heffernan; A McGarry, K Cahill, G Ruane; PJ Monaghan, K Mortimer, N Connelly; P Fallon, K Staunton (0-1); K O’Neill (0-3), T Morley, J Conmy; R Golding, J McCallion (0-1), R Dempsey (0-2). Subs: O Walsh for Fallon, M Coleman for Morley. SEMI-FINAL: Mayo 2-18 Sligo 1-5 (MacHale Park, 26/6/1994). MAYO: B Heffernan; A McGarry, K Cahill, G Ruane; P Holmes, M Coleman, P Butler (0-1); P Fallon (0-1), K Staunton (0-1); K O’Neill (1-7, two frees), C McManamon, R Golding (0-3); C McDonald (0-1), L McHale (1-1), K Lydon (0-3). Sub: J Casey for Holmes. FINAL: Leitrim 0-12 Mayo 2-4 (Dr Hyde Park, 24/7/1994). MAYO: B Heffernan; A McGarry, K Cahill, G Ruane; P Holmes, M Coleman, P Butler; C McManamon, K Staunton (1-0); K O’Neill (0-1, a free), P Fallon (1-0), T Morley; J Conmy, L McHale, K Lydon. Subs: J Casey for Morley, R Golding (0-2) for Conmy, C McDonald (0-1) for Lydon. Armagh 2-13 Mayo 1-10 (Armagh Athletic Grounds, 16/10/1994). MAYO: B Heffernan; A McGarry, K Cahill, G Ruane; J Finn, M Coleman, P Butler; A Jennings, P Fallon (0-1); K O’Neill (0-5), K Mortimer, P Brogan; D Byrne (0-1), R Dempsey (1-1), K Lydon (0-1). Sub: J Jennings (0-1) for Brogan. Mayo 1-4 Louth 1-8 (MacHale Park, 30/10/1994). MAYO: B Heffernan; K Mortimer, K Cahill, G Ruane; A McGarry, M Coleman, J Finn; C McManamon, P Fallon; R Golding, P Brogan (1-2), K O’Neill; D Byrne, R Dempsey (0-1), K Lydon (0-1). Cork 1-9 Mayo 0-7 (Pairc Ui Rinn, 13/11/1994). MAYO: B Heffernan; P Butler, K Cahill, K Mortimer; A McGarry, M Coleman, P Holmes; C McManamon, P Fallon; L Niland (0-2), P Brogan (0-2), K Lydon; C McDonald (0-1), J McCallion, B Fitzpatrick. Subs: K Staunton (0-1) for Fallon, J Jennings for Lydon, S Trench for Brogan. Mayo 1-7 Leitrim 0-13 (Charlestown, 27/11/1994). MAYO: B Heffernan; P Butler, K Cahill, K Mortimer; A McGarry, M Coleman, P Holmes; C McManamon (1-1), P Fallon (0-1); L Niland (0-1), J Jennings, P Brogan (0-3); C McDonald (0-1), K Lydon, B Fitzpatrick. Subs: J Casey for Fitzpatrick, K Staunton for Niland, D Byrne for McDonald. SEMI-FINAL: Mayo 0-13 Leitrim 0-11 (MacHale Park, 13/7/1994). MAYO: B Heffernan; F Costello, K Morley, D Mulligan; P Cunney, K Mortimer (0-1), J Casey; R McNamara, J Nallen; D O’Loughlin (0-2), K O’Neill (0-4), R Golding; C MacDonald (0-2), D Jennings (0-3), M Sheridan (0-1, free). Subs: M Smyth for Nallen, R Ruane for Sheridan, D Sweeney for Golding. FINAL: Mayo 0-12 Sligo 0-6 (MacHale Park, 29/7/1994). MAYO: B Heffernan; F Costello, K Morley, D Mulligan; P Cunney, K Mortimer, J Casey; R McNamara, J Nallen; D O’Loughlin (0-1), R Ruane, R Golding (0-2); C MacDonald (0-3), D Jennings (0-1), M Sheridan (0-5). Subs: D Byrne for Ruane, D Smith for McNamara, D McHugh for Golding. SEMI-FINAL: Mayo 1-15 Fermanagh 2-10 (Pairc Sean MacDiarmada, Carrick-on-Shannon, 6/8/1994). MAYO: B Heffernan; F Costello, K Morley, D Mulligan; P Cunney, K Mortimer, J Casey; R McNamara (0-2), J Nallen; D O’Loughlin (1-1), D Jennings (0-1), R Golding (0-1); C MacDonald (0-3), R Ruane (0-1), M Sheridan (0-6, three frees and a ’45). Subs: D Byrne for Nallen, TJ McHugh for Jennings. FINAL: Cork 1-12 Mayo 1-5 (Cusack Park, Ennis, ). MAYO: Barry Heffernan; Fergal Costello, Kenneth Morley, James Nallen; Paul Cunney, Kenneth Mortimer, John Casey; Ronan McNamara, David O’Loughlin; Ronan Ruane (0-1), Declan Jennings, Ronan Golding; Kevin O’Neill (1-1), Ciaran MacDonald (0-3), Maurice Sheridan. Subs: D Byrne for O’Loughlin, M Smith for Jennings, D McHugh for McNamara. SEMI-FINAL: Mayo 1-8 Sligo 0-9 (MacHale Park, 26/6/1994). MAYO: Peter Burke; David Heaney, Russell Gibbons, Brian Gallagher; Colm Conneely, Paddy Reddington, Eric Heneghan; Tomas Morley, Sean Roughneen; Colm Foody (0-3), Declan Sweeney (1-2), Brian Ruane; Keith Burke (0-2), Fergal Kelly (0-1), Robert Fahey. Subs: Joe Ryan for Fahey, Shane Fitzmaurice for Burke. FINAL: Galway 2-11 Mayo 0-9 (Dr Hyde Park, 24/7/1994). 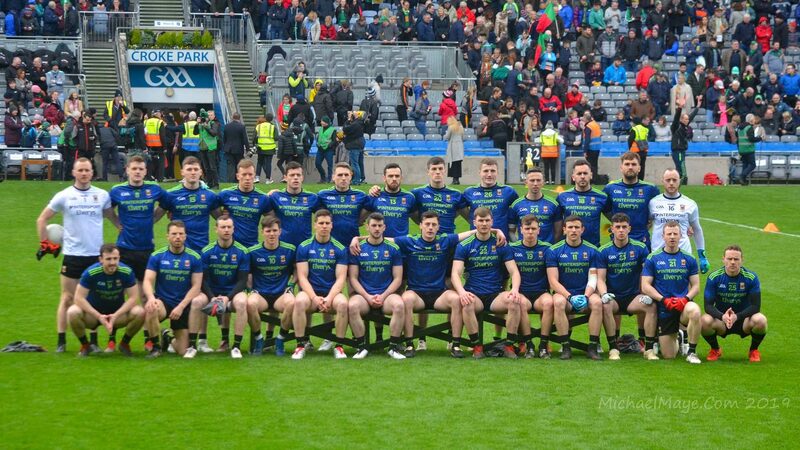 MAYO: Peter Burke; David Heaney, Russell Gibbons, Brian Gallagher; Colm Conneely, Paddy Reddington, Eric Heneghan; Tomas Morley, Shane Fitzmaurice; Kenneth Walsh (0-6), Sean Roughneen (0-2), Declan Sweeney; Joe Ryan, Fergal Kelly (0-1), Colm Foody. Subs: Jimmy Kelly for Ryan, Keith Burke for Fitzmaurice, John Byrne for Sweeney.